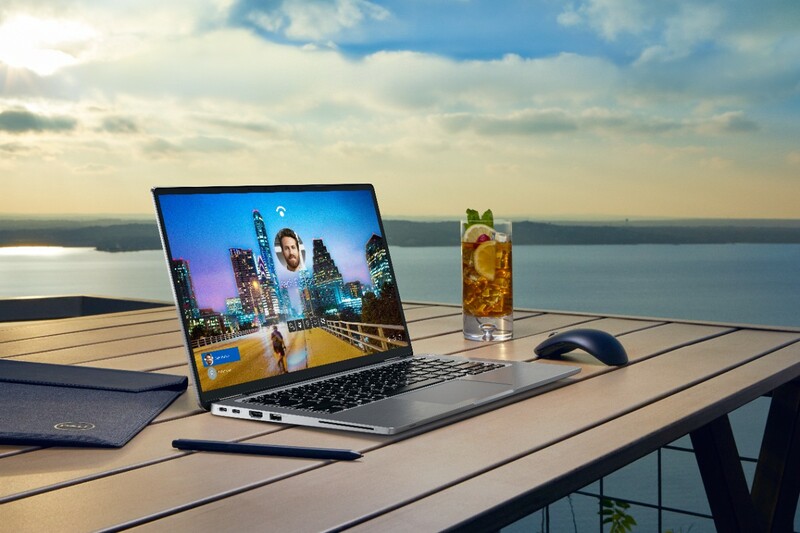 We’re thrilled that the new Latitude 7400 2-in-1 is finally available for purchase! You have likely seen coverage from CES or read the details in Rahul’s blog, but to understand how the engineering team got here, I sat down with Michael Smith, Dell’s VP of Commercial Design, to wrap my head around some technical hurdles the team overcame while staying true to the original design intent. I didn’t expect an easy, breezy tale, but this rabbit hole turned out to be much deeper than I expected. A “no compromise” stance ultimately meant re-thinking every square millimeter of a business 2-in-1. No sacrifices on size, security, connectivity, or battery life meant breaking a lot of new ground in development. The team would not just be designers and engineers, but also inventors. This is how it started. 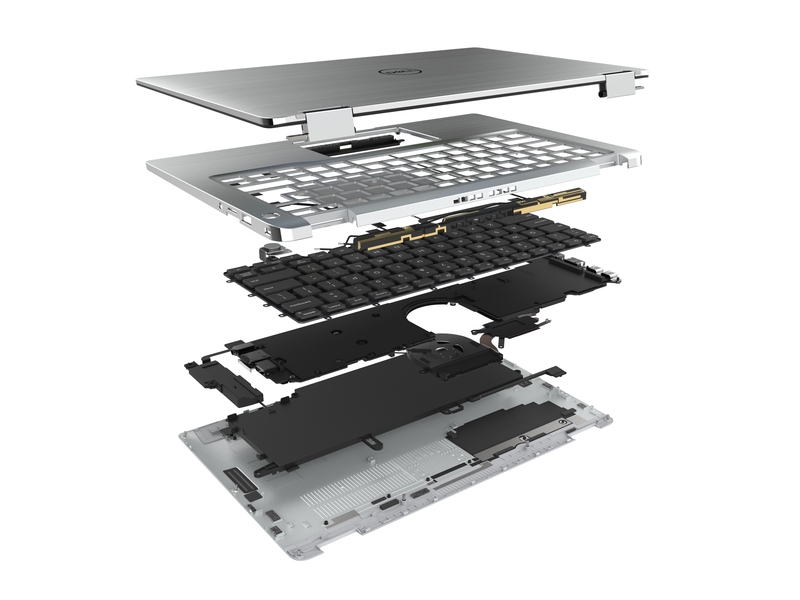 In 2015 XPS had its break-out moment by fitting a 13” display into a chassis closer to the size of traditional 11 or 12” notebooks thanks to the tiny bezels of its InfinityEdge display. 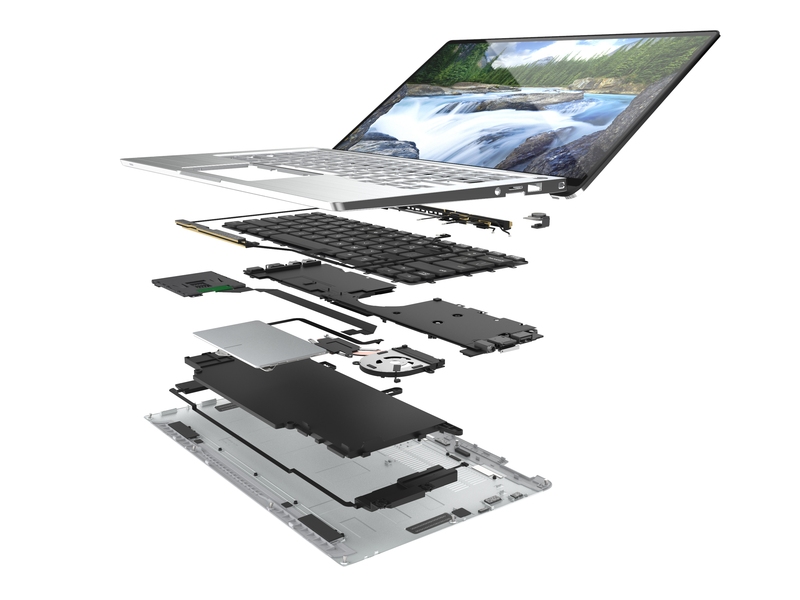 Flying in the face of the “thin at any cost” trend, XPS focused on form-factor and features that matter – footprint, performance and quality – to set Dell’s course that competitors would attempt to follow over the coming years. And there was a reason. XPS 13’s form factor didn’t allow for the features enterprise customers demand. The (until recently) bottom-mounted web cam would have been a non-starter, not to mention its chassis doesn’t have room for mobile broadband antennas, smart card reader, HDMI and USB type-A ports, or a Unified Security Hub. So, while making XPS was hard, creating this new Latitude was even tougher. But that’s exactly the challenge that the engineering team accepted when they set out to re-imagine the 7000 series for Latitude. Simply put, nothing less than a productive and modern icon of design that builds upon Latitude’s 25 years of trusted history would do. Having a commitment to a clear vision, it turns out, would be the key to success. The team set in stone an unmovable goalpost of elevated design and performance in the smallest 14” 2-in-1 on the planet. That “smallest footprint” win would come about thanks to investing in a custom, narrow bezel panel that would accommodate active pen support, a top-mounted webcam and sensor array for a new, first-to-market twist on Windows Hello. This was step-one from which every subsequent decision would pivot. Fundamentals like battery life, usability and wireless performance were slated not only to hold ground, but to dramatically improve as well. So, as the design team began to encounter challenges where the answer would normally be “grow the footprint,” or “compromise on a feature,” they dug in their heels with the mantra of Simplify Thoughtfully. Not budging on the design but keeping and improving every element that makes a 7000-series Latitude our very best enterprise-class mobile PC was a challenge at every turn. How did that play out? That diamond-cut aluminum chassis design was going to look great, but it created a challenge for WiFi and LTE antennas. 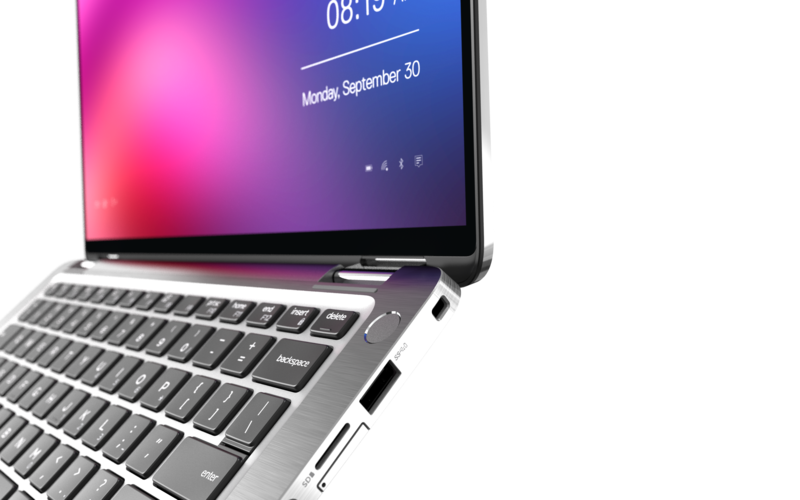 Aluminum interferes with RF (radio frequency) signals and the Latitude 7400 2-in-1 had to maintain excellent signal at any position within a 360-degree rotation of its hinge. While using a wider plastic border surrounding the display to house the antennas would have solved the challenge, the team was determined not to compromise the footprint or materials. The solution was a custom-designed, tunable, etched polymer antenna with gold-plated copper elements relocated to the base between the hinges, delivering gigabit LTE connection and nearly tripling previous WWAN performance. Problem solved, right? The antenna and other decisions set off a domino effect of changes, each of which had to be solved while maintaining and delivering on other feature needs. The cooling solution had to be relocated to the center of the mother board to maintain performance and increase system density. In fact, every facet of the design was re-engineered. The user experience wouldn’t be compromised, so the team coded power management to work with the onboard gyroscope, giving the system the ability to know if it’s on a table and can run hard or if it’s sitting on a lap and needs to keep the surface temperatures lower for a pleasant experience. Groove-sintered composite-wick heat pipe technology was used for efficiency, but to maximize airflow the team designed a more compact fan from liquid crystal polymer, a resin very similar to the Kevlar material used in armored vests, which allowed a blade thickness of just 0.3 mm. And to ensure heat was rejected out of the chassis and not absorbed, the team strategically applied a new, first-to-market version of GORE insulation only 0.1 mm thick. Infused with the same aerogel used on NASA’s Stardust space probe, it is quite literally the best insulator known to man. Comfort and efficiency? Check. So the team held the line for the sake of a gorgeous and compact, machined aluminum chassis. And while most 2-in-1s give up battery life or grow size to accommodate the 360-degree hinge needed for a convertible, the team stayed committed to “no compromises.” In fact, while reducing footprint, they upped the previous Latitude convertible’s 60Whrs to a generous 78Whrs for the 7400 2-in-1 and combined it with a new generation of low-power display. That combination, along with adaptive power management, allowed us to lay claim to the title of world’s longest-lasting 14” commercial 2-in-1, because beauty without stamina would be a fail. Space was tight, and two battery choices were designed to give customers the option of including a smart card reader. But to get to that density, one battery layer wouldn’t work. The team considered a number of alternatives including stacked battery cells for power density. To maintain the kind of thermal performance Latitude considered acceptable during fast charge or heavy depletion, they went a different route. The answer was a step-tiered design that not only made use of every available cubic millimeter, but also provided an improved thermal dissipation profile while accommodating the space needed for various configuration options. Aluminum chassis parts, holding to a tiny footprint, expanding batteries and shuffling antenna and thermal solution locations… all these decisions caused a cascade of challenges requiring each sub-system team to work in concert with the others. This interdependency and synchronization is what Michael refers to as “connective tissue”. He explained that it is much more challenging to solve all these problems without doing it at the expense of key design decisions. What else? The near-field communication transmitter was moved under the clickpad with the WiFi antenna next to it, and the team refused to budge on providing multiple type-A USB 3.1 and type-C Thunderbolt 3.0 ports which work with modern type-C docking solutions. Dell’s evolving Thunderbolt and USB ecosystems will work today as well as tomorrow. With all these challenges, something had to give at a foundational level. The PCB layout had to change. After some hard layout work and custom EMI shielding, it ended up being the densest motherboard Dell has ever created for a notebook. Oh, and the keyboard and touchpad? Michael set the Latitude next to my XPS 15 and told me to put a hand on each. I’d always felt the XPS 13 and XPS 15 keyboards were great, but experiencing these side by side, I could feel the difference. The latitude keyboard has just enough additional travel and a slightly more sharp and defined pressure profile that I immediately preferred. Great… I couldn’t un-feel that. He explained that they also redesigned the keyboard layout with an asymmetrical pitch spreading the keys just a bit more horizontally to help reduce typing fatigue. Next, Michael asked me to try out the new glass clickpad and to pay close attention. As Michael detailed the scrutiny poured into getting the surface friction just right, I ran my finger over the pad to appreciate it. Next, I compared its click to another device… again, focusing on the detail. The feedback isn’t mushy or stiff. Clicks are audible, but not harsh. It’s quiet and refined. The responsive and comfortable keyboard and the quiet clickpad will make for a great office companion that’s also friendly to the ears around you. Michael reminded me that a 2-in-1 is likely going to be used for a sketchpad and note taking. Even with the real estate premium on the crowded innards, they still found a way to include not one, but two magnets so that the active stylus will attach to either side of the device. True story: the team actually came close to removing one of the magnets when the device was right on the threshold of a critical weight metric, but the priority of user experience and flexible choices trumped the fraction of an ounce and the team found a way to keep both magnetic attach points. No compromises. And that hinge? No 360-degree hinge Dell has made before met all their criteria. It needed to minimize the vertical height when open because we all know that guy in front of you is going to recline his seat as soon as the plane is in the air. The variable-torque, sequential drop-hinge design they created also has a beautiful bottom bezel that’s almost as thin as the other three. Comparing the Latitude to other convertibles, I see clearly how this attention to detail delivers a four-sided, narrow border view that I haven’t seen before on a 360 device, and just how obnoxious the bottom bezel begins to look on those other machines. But that wasn’t enough, because the team also demanded one-finger opening for convenience when your hands are full, so the hinge was designed with variable torque. Initial travel comes with light effort and stiffens up around 90 degrees so tapping the touchscreen doesn’t feel like playing with a bobblehead. A another behind the scenes note… if you experienced the prototype Latitude 7400 2-in-1 at CES, the hinges were not quite final and still in the process of being refined. The team was making last-minute tuning to ensure the hinge will deliver just the right level of increasing resistance. At this point I finally understood how much collaboration and work I was holding in my hand. I was more than a little overwhelmed by the level of detail and the number of elements that had to come together for hardware, software, layout and options to yield the world’s smallest commercial 14” 2-in-1 with the longest battery life… which happens to be just as gorgeous as any consumer machine I’ve ever held. They even have a custom-tailored system sleeve to keep that pretty machine scratch-free in your bag. No stone left unturned. Michael stressed how much debate and energy went into selecting just the right finish, and I admitted this is like no Latitude I’ve ever held. He’s particularly proud of the Titan Gray brushed aluminum with impeccable fit and finish. And if you haven’t held this Latitude, you really shouldn’t… unless you’re serious. Because it will make an impression. As we wrapped up, I thought back to the first demo I’d seen of this new Latitude and how it can sense your presence and automatically wake to start the login process or lock up when you walk away for convenient security. The collaboration of Dell and Intel engineers that produced the ExpressSign-in feature is whole other story, but at this point Michael is shaking my hand and telling me he’s late for a meeting. He’s given me more to think about than I can process. I set off to work but I can’t shake this burden of knowing that somewhere down the line, I have to convince the Latitude team that it’s in their best interest to swap out my current work laptop with a new Latitude 7400 2-in-1.